Heat oven to 350ºF (325ºF for dark or nonstick pan). Grease or spray bottom of 13x9-inch pan. In large bowl, beat cake mix, water, oil and eggs with electric mixer on low speed 30 seconds, then on medium speed 2 minutes, scraping bowl occasionally. Pour half of the batter into pan. Bake 22 minutes (25 minutes for dark or nonstick pan). Refrigerate remaining batter. Meanwhile, in 1-quart saucepan, heat caramels and evaporated milk over medium heat, stirring frequently, until caramels are melted. Stir in pecans. 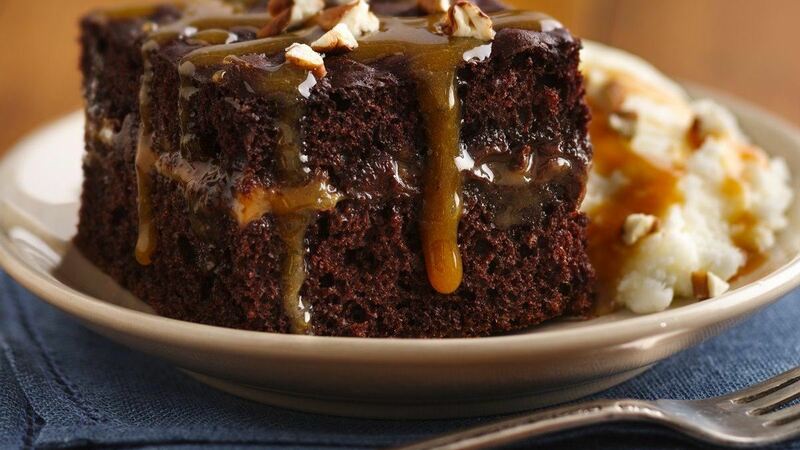 Pour caramel mixture over warm cake in pan. Sprinkle with chocolate chips. Spread with remaining batter. Bake 25 minutes (29 minutes for dark or nonstick pan) or until cake springs back when lightly touched. Run knife around sides of pan to loosen cake. Cool at least 30 minutes. Serve with ice cream, drizzle with topping and sprinkle with pecans. Store loosely covered at room temperature.